We like to think that volunteering and giving back to our communities, guests, and neighbors is a part of our DNA. We know the importance and value of taking care of people both inside and outside our facilities. We encourage our team members to be active volunteers in their neighborhoods, and do what we can to support them in those endeavors. Because volunteers give their time and energy and ask nothing in return, we take the months of April and May to recognize those that have gone above and beyond the call of duty. From over 1,000 team members who volunteered over 36,000 hours of their time in 2014, we’re proud to announce that this year’s Eat’n Park Hospitality Group Volunteer of the Year is Tim H.! Tim is part of our Parkhust Division, and is a line cook at Google, where he has been a team member for 2.5 years. Tim invests hundreds of hours annually to helping people and animals in need. His hands-on (and often behind the scenes) work results in an immediate positive impact: he volunteers with several animal rescue and rehabilitation programs, he cooks at shelters, and outreaches to homeless individuals to help meet their most urgent needs. Tim is passionate about volunteering because he feels he’s fortunate enough to have the ability and means to do so. 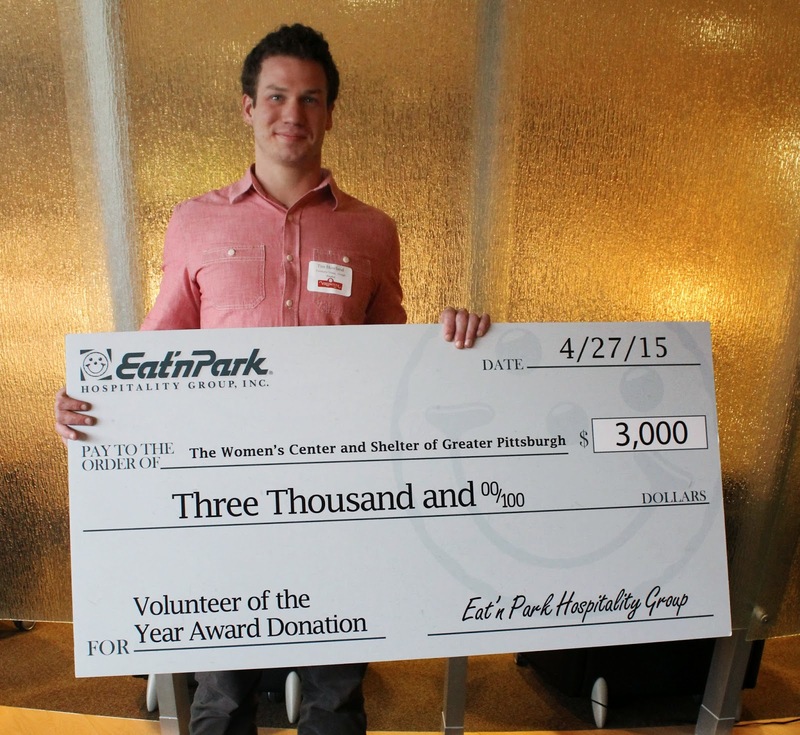 In Tim’s honor, Eat’n Park Hospitality Group will be donating $3,000 to the Women’s Center and Shelter of Greater Pittsburgh. Founded in 1974 by Ellen Berliner and Anne Steytler, Women's Center & Shelter of Greater Pittsburgh (WC&S) was one of the first six shelters in the United States for battered women. Since its inception WC&S has been at the forefront of the Battered Women's Movement, creating and implementing innovative and effective programming aimed at preventing domestic violence and providing services to domestic violence victims. Please join us in congratulating Tim and our other finalists for their extensive efforts in the community! It’s time for you to break out the grill and let us do the baking this holiday weekend with this coupon for $1 off a whole pie or dozen Smiley Cookies! Strawberry Pie, anyone? It’s on sale this month for just $9.99! Coupon valid Thursday, May 21 – Monday, May 25, 2015 only. New Summer Specials Have Arrived! It’s time to blow up those beach balls and dust off your sunglasses because summer is finally upon us! To celebrate, we’ve cooked up a brand new menu! Read on for all the details! A must try for the vegetable lover! 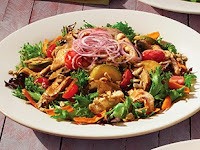 This new salad contains mixed greens packed with marinated grilled chicken, cremini mushrooms, carrots, red onions, sunflower seeds , and fresh, local zucchini and tomatoes (in season). It’s served with white balsamic vinaigrette for only $8.99! This salad is a returning guest favorite! 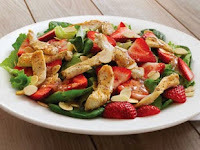 We take Julienne-sliced grilled chicken breast and serve it on a bed of mixed greens and spinach, then top it off with sliced California strawberries, and toasted almonds. It comes with our warm poppy and sesame seed dressing for only $8.49! It’s back! 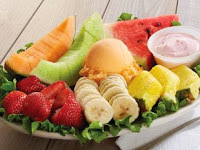 Featuring fresh-cut honeydew, cantaloupe, watermelon, pineapple, strawberries, and bananas, it’s a refreshing combination to eat on a hot day! Plus, it’s served with your choice of sherbet or cottage cheese, along with our exclusive creamy dipping sauce for $7.99! 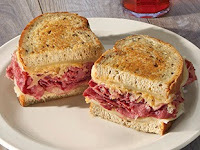 This classic sandwich features freshly sliced corned beef, sauerkraut, melted Swiss cheese, and Thousand Island dressing piled high on our house-baked rye bread. Try one today for only $6.99! Kick your meal up a notch with this zesty creation. 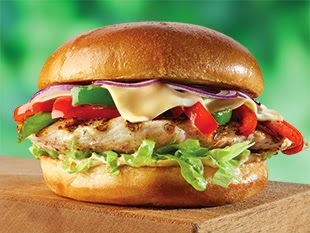 Grilled with Cajun seasoning, and topped with our own jalapeno sauce, shredded lettuce, grilled bell peppers, habanero Jack cheese and red onions, this masterpiece is bursting with flavor. Plus, you can customize it with your own protein! 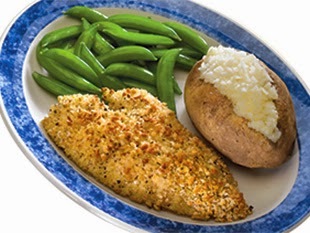 It’s served with your choice of one side for only $8.49! A returning classic! Enjoy herb-crusted baked chicken breast topped with our homemade bruschetta, and finished with a balsamic glaze and Asiago cheese. It also features fresh, local tomatoes (in season). It’s only $9.99 and includes your choice of two sides and bakery-fresh rolls. If you love our Chicken Bruschetta then this new appetizer is for you! 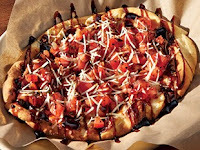 We top an oven-crisped flatbread with mozzarella, our housemade bruschetta, and a drizzle of balsamic glaze before adding a sprinkle of Asiago cheese. It’s only $6.99 and perfect to share with friends and family! You don’t have to go to Italy for great Italian cuisine! 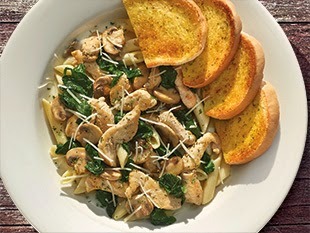 We take grilled chicken breast, mushrooms, and fresh spinach and serve it over a heaping helping of penne pasta with our housemade cream sauce. It’s finished with Asiago cheese and served with garlic toast and our Soup, Salad, and Fruit Bar. 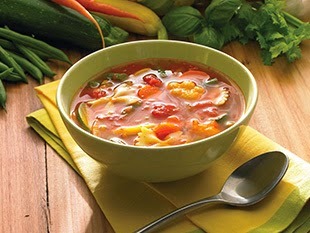 This vegetable packed soup contains onions, carrots, celery, cauliflower, zucchini, yellow squash, and green beans simmered in a rich tomato-based broth, with bow-tie pasta. It’s mouth-wateringly delicious and features produce fresh from local farms (in season). Try a cup for $2.99 or a bowl for $3.49! 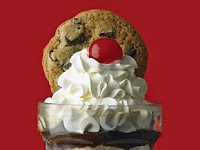 This sweet delight has layers of crumbled chocolate chip cookies, hot fudge, and vanilla ice cream. We them complete it with whipped topping, a chocolate chip cookie, and a cherry. Enjoy this treat for $3.99! Not in the mood for a large dessert? Try our Mini Cookie Fudge Fantasy for only $2.99! 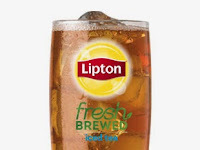 This ice tea combines the flavors of passion fruit, mango, pineapple, guava, and citrus to make the ultimate tropical tea experience. Enjoy this beverage with unlimited refills for only $1.99! Don’t forget to check out our new line up of Salad Bar Dinner Deals, which include our Chicken Bruschetta and Chicken Pasta Florentine! Enjoy New Salad Bar Dinner Deals! We’ve got a new lineup of Salad Bar Dinner Deals and we can’t wait for you to try them! Available from 4-9PM, enjoy any of these delicious dinners coupled with our endless Soup, Salad, and Fruit Bar starting at just $9.99! 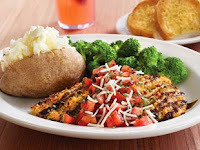 This flavorful dish is back by popular demand and boasts a herb-crusted baked chicken breast topped with our homemade bruschetta (using fresh, local tomatoes in season). Then, it's finished with a drizzle of balsamic glaze and Asiago cheese. It’s served with your choice of one side, bakery-fresh rolls and our Soup, Salad, and Fruit Bar. You’ll be Eat’n Smart with this low calorie meal that is packed full of flavor. 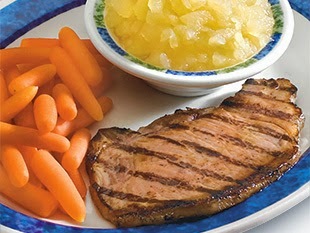 This dish features our robust pork chop marinated in a mixture of sesame, garlic, ginger, and teriyaki sauce. It’s delicious and is served with one side, bakery-fresh rolls, and our Soup, Salad, and Fruit Bar. One of our all-time guest favorites! This oven-baked cod is stuffed with our homemade blend of crabmeat, shrimp, spinach, onions, cheddar cheese, and cracker crumbs. It’s served with your choice of one side, bakery-fresh rolls and our Soup, Salad, and Fruit Bar. 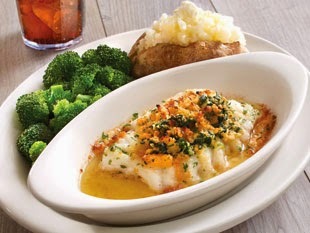 A flaky sole filet lightly crusted with Parmesan breadcrumbs and drizzled with butter and fresh-squeezed lemon. It’s the perfect meal for those sunny summer days! Plus, it’s served with your choice of one side, bakery-fresh rolls and our Soup, Salad, and Fruit Bar. Like what you see? Check out our full list of new summer specials! Need help finding the perfect present to show Mom your appreciation? We’ve got you covered! 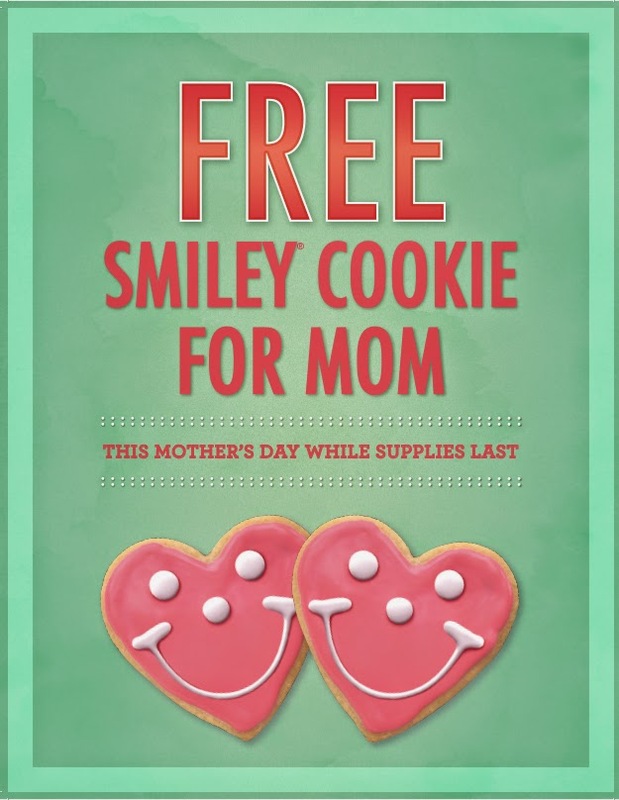 Moms make us smile so we’re giving all Moms a free Smiley Cookie with their meal (while supplies last) on Mother’s Day! Did you know that Smiley Cookies go well with our Mother’s Day Brunch Buffet? It’s available from 11-2 PM and is only $9.49, making it the perfect way to create some new family memories. 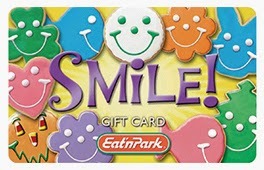 Another great gift idea is Eat’n Park gift cards! Mom will love this gift that’s practical and fun all at the same time! For the last minute shopper, e-gift cards are the way to go. It can be delivered to her inbox almost instantly and is a great cyber surprise! 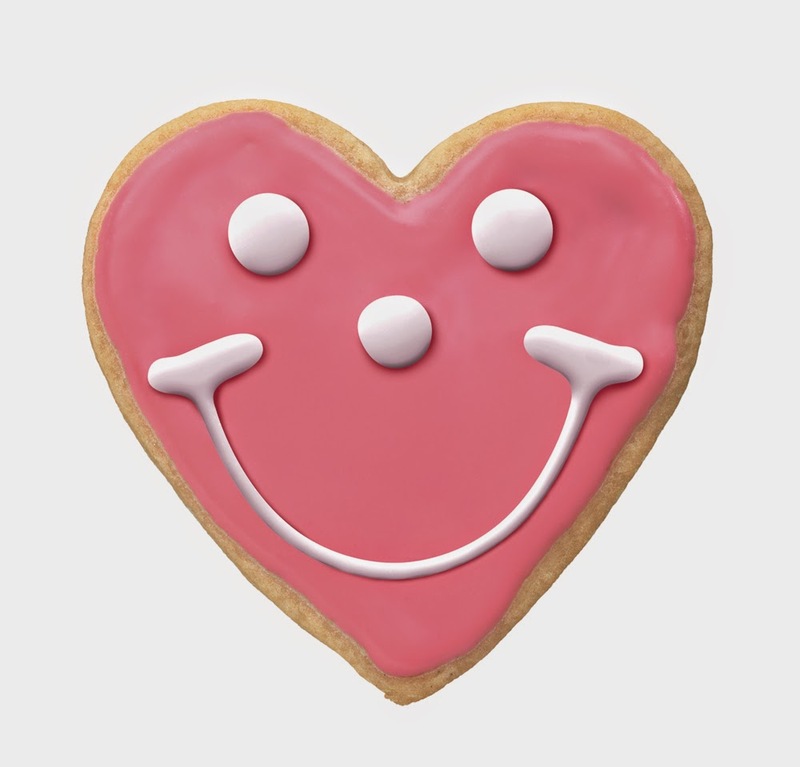 Free Smiley Cookie: Help us support United for Women! At Eat’n Park Hospitality Group, we’ve long been a partner of the United Way, with team members generously donating to our annual campaign to support critical community needs. With Mother’s Day right around the corner, we’re teaming up on the United Way of Allegheny County’s “Love Mom” campaign – and you can help! Now through May 13, all donors who contribute to the campaign through the text-to-give program will receive a free Smiley Cookie at Eat’n Park. Text "UnitedforWomen" to 51555 to make your donation. You'll receive a confirmation email; just print & bring it to Eat'n Park by May 17 to enjoy your free Smiley Cookie! United for Women helps those facing financial crises due to unexpected life events such as layoffs, accidents, divorce, a health crisis, or death of a spouse – all of which can send vulnerable women spiraling into poverty. United for Women provides a bridge to help get them back on their feet. Below, read about Lisa, who found herself struggling emotionally and financially after sustaining injuries in a car accident. United for Women was there to help. Lisa was on her way to work on August 19, 2014 when a careless driver smashed into the back of her car. While she healed Lisa was isolated, depressed, and “had absolutely no income”. She was close to homelessness when she reached out to a United for Women-funded program that helps women recover from an unexpected first-time financial crisis. The program brought Lisa’s rent and utility bills up to date and linked her to longer term employment supports. By Christmas, she had a new job. Lisa had felt so alone, but after connecting with the program she felt blessed. Her accident gave her clarity about how quickly life can change. “I learned so much about the value of things I always took for granted. I’m getting better; not everyone can say that.” United for Women gave Lisa “friendship, someone who understood and helped me get my life back.” Lisa plans to volunteer to assist other women in similar situations. “These programs are so needed,” she says.